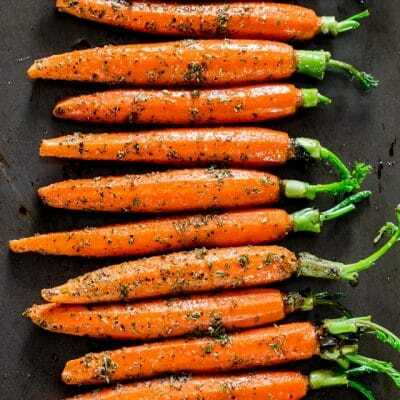 Garlic and Herb Roasted Carrots – these carrots are roasted to perfection with lots of garlic and herbs such as thyme, basil and oregano, creating the perfect side dish. Before I start to talk about this easy side dish, I want to thank you all for all your kind words in regards to my book. You guys are awesome and I really love you all. In case you have’t left me a comment yet on the cookbook post, hurry up and do it now for your chance to win one of five signed copies of my book. You never know, you could be one of the lucky ones. Well, we’re still on our road trip, currently in Montreal right now and all I have to say is what a city! It’s so gorgeous and the buildings are incredible. We got a chance to visit Notre-Dame Basilica today and it’s simply breathtaking. Follow me on instagram for pictures and videos from my trip. Now finally, let’s talk about these garlic and herb roasted carrots. I found these fresh carrots at my local grocery store and I buy them whenever I see them, but if you can’t find these, just use regular carrots, or baby carrots work just as well too. This is an incredibly easy side dish to make and it goes perfectly with any meat you make, like a roast chicken, or pork roast. It’s also perfect for a holiday dinner and even just as a healthy snack. 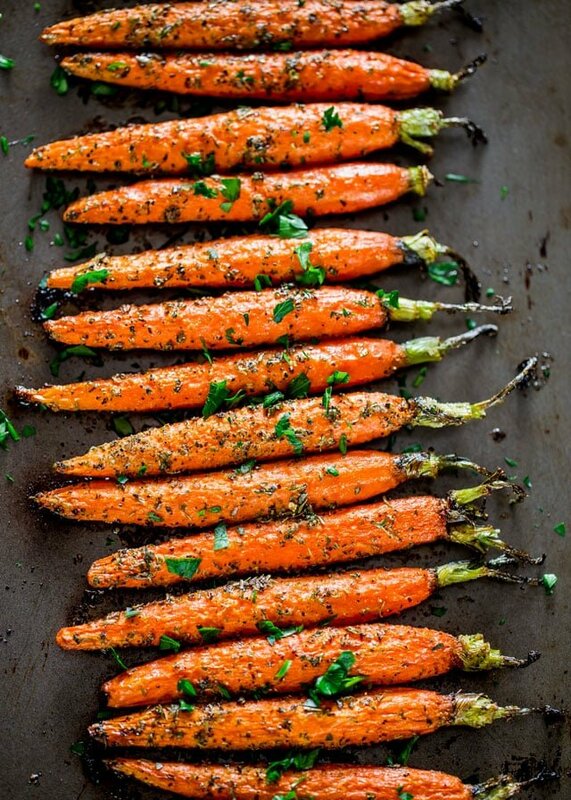 They’re wonderfully seasoned with garlic and lots of herbs such as thyme, oregano and basil, so if you love your herbs then these carrots are for you! Garlic and Herb Roasted Carrots - these carrots are roasted to perfection with lots of garlic and herbs such as thyme, basil and oregano, creating the perfect side dish. Preheat oven to 375 F degrees. Lightly oil a baking sheet with cooking spray. In a small bowl mix the garlic, oregano, basil, parsley, thyme, salt and pepper together. 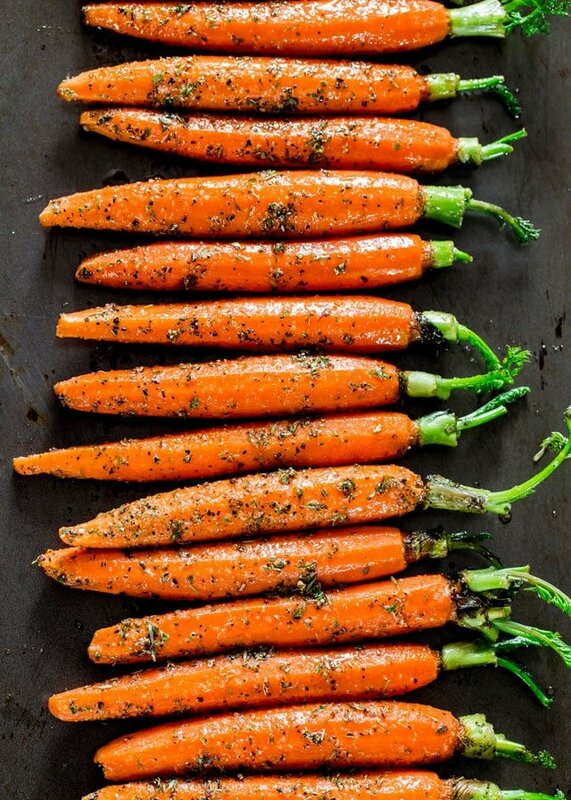 Sprinkle the garlic herb mixture over the carrots along with the 2 tbsp of olive oil. Toss everything together, making sure each carrot is seasoned with the garlic and herb mixture. Arrange the carrots in a single layer on the baking sheet and bake for 35 minutes or until fork tender. If you use fresh herbs, cook the carrots for 20 minutes and mix them with the herbs for the last 10 minutes of cooking to avoid having the herbs burn. Omg I have become addicted to these carrots! I rarely ate them before as I just didn’t care for the blandness but wow. This is definitely a recipe I will use for life. I’ve already passed it on to everyone I know lol. Can you use fresh herbs? Sure, I just probably wouldn’t add them till the end. I made these for lunch today. Easy and taste awesome. Glad I’ve got plenty to rewarm for dinner.